Goldendoodles get their names from their mixed heritage of Golden Retriever and Poodle parents. First bred in the early 1990’s as allergy-friendly seeing-eye dogs, Goldendoodles have now become just as popular as family companions and embody the best personality traits of both of their highly popular parent breeds. Size & Weight: Goldendoodles are a range of sizes including standard, medium, and miniature (if the Poodle parent was a miniature). Standard Goldendoodles stand at 22-26 inches at the shoulder and weigh between 45-70 pounds. Medium Goldendoodles weigh between 30-45 pounds, and miniatures weigh between 15-30 pounds. 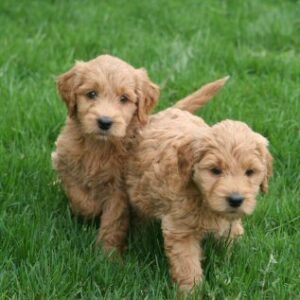 Coat & Color: Goldendoodles can be any mix of cream, gold, tan, brown, grey, or black. Many Goldendoodles inherit the fur qualities of their Poodle parent, but not the texture, so they shed very little, if at all. Golden Retrievers and Poodles have much in common temperament-wise—both are great family dogs, friendly, highly intelligent, affectionate, and easy to train. With these overlapping character traits, you can see why the Goldendoodle makes such a great companion. Because the Goldendoodle is a very human-orientated dog, they develop strong bonds with their human companions and show lots of affection. They are also very calm and patient dogs, which makes them great with children. Something to Bark About: Poodles are ranked as the 2nd smartest dog breed in the world, and Golden Retrievers are ranked 4th. With those genes, you could say the Goldendoodle is one of the great intellectuals of the dog world! Goldendoodles are considered hypo-allergenic, so they are great for families who suffer from allergies. Goldendoodles tend to be very healthy dogs with a long life-expectancy. They get along great with adults, children, and other animals. Because Goldendoodles are social, active dogs, they need daily exercise, like a run in the park or a game of catch to keep them from getting mischievous. 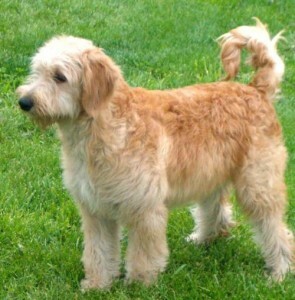 If you’d like to adopt a family-friendly Goldendoodle, visit Adoptapet.com to find one in your area.